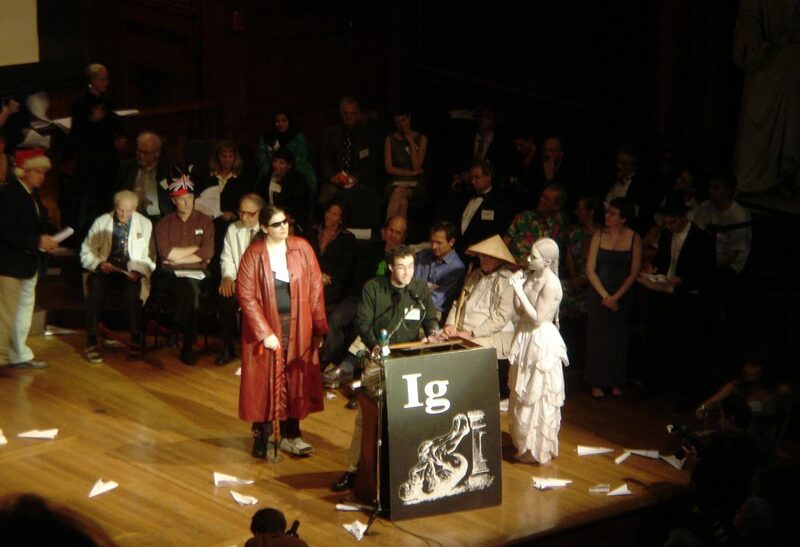 The 28th Annual Ig Nobel Awards took place on the 13th of September at Harvard University, awarding achievements that make people laugh — and then think. From treating kidney stones with rollercoasters to using human saliva to clean your kitchen countertop, awards are broad and hilarious. It’s organised by the scientific magazine, Annals of Improbable Research, and is co-sponsored by the Harvard-Radcliffe Society of Physics Students, and the Harvard-Radcliffe Science Fiction Association. This year’s winners in the Medicine category were Marc Mitchell and David Wartinger. Their research was in rollercoaster rides that attempt to hasten the passage of kidney stones. Kidney stone treatment is a problem in almost all parts of the world. After going through the Big Thunder Mountain rollercoaster in Florida Disneyland, some people experienced the passing of painful renal calculi. The study was to find the relationship between riding rollercoasters and passing kidney stones — data was actually generated to support this study. Like ‘proper’ scientists, Mitchell and Wartinger placed a pyelocalyceal model (a model of a human urethra and kidney system) in a backpack and took it on the rollercoaster with them. It delightfully showed the same results as reported by rollercoaster enthusiasts. The positions of the kidney stones were recorded and the renal calculi were adjusted after every ride during the 2008 amusement park season. This year’s peace prize winners were Francisco Alonso, Cristina Esteban, Andrea Serge, Maria-Luisa Ballestar, Jaime Sanmartín, Constanza Calatayud, and Beatriz Alama. They won the award for measuring the frequency of shouts and curses during an automobile ride (otherwise known as ‘road rage’). Their research involved observing aggressive behaviour on roads and comparing data from different places. There were many factors behind the aggressive behaviour on roads such as bad driving, the stress of the driver, fatigue etc. For improving these conditions on the road, it had been proved that road safety education and campaigns could promote road safety culture among drivers. The economics prize was won by Lindie Hanyu Liang, Douglas Brown, Huiwen Lian, Samuel Hanig, D. Lance Ferris, and Lisa Keeping, for investigating the effectiveness of using voodoo dolls to retaliate against abusive bosses. Their research summarises that companies should not punish their subordinates for their revenge, but rather look into the causes and roots that affected the retaliation. Their research, rather than focusing only on the disadvantages of subordinate retaliation, also talks about its advantages. Subordinates who had not been allowed to retaliate felt a level of social injustice. In the study, subordinates were asked to visualise a workplace in which their bosses treated them with hostile behaviours. Great ideas and innovations can take any form. The Ig Nobel Awards celebrate the genius in the more frivolous and fun sides of acadenuc research, and will always inspire future generations of research.